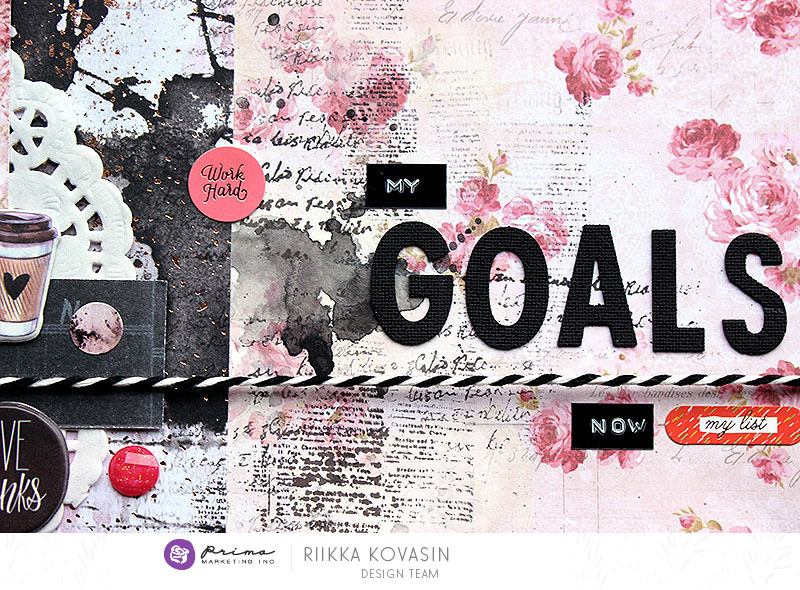 Come watch Riikka mix Prima’s Love Story and Amelia Rose papers and a sprinkling of art mediums on her goal-oriented layout. Plus do not miss her video documenting her creative process on this fun page! “Hello there! Oh boy I’m so happy to be here! It’s just an honor to belong to the Prima team and I just couldn’t believe I would make it to yet another term. So grateful! Tip 1. Oldies, but goodies. When I started making layouts about ten years ago, Dymo writers were the thing. I bought myself one and used it for several pages and cards but, somehow, along the years I forgot about it. But, what a handy tool it is! So, go through your stash, and see if you also have this kind of treasure! Tip 2. Over and out. Stamping is a good way to “blend” an edge whether it is two papers, a paint layer, or something else. By stamping along and over the edge, you are hiding the edge and making the transition from one surface to the other more smooth. Tip 3. Fear of the dark. Don’t be afraid of black. In small amounts it might be just the thing the page needs! At the very least I try to add something black and something white to all my projects. Just think what to pair the black with and how much to use it. Tip 4. No noose is a good noose. A simple line across the page might be a real page turner. You can draw or paint one, but using twine is a really easy way to add a linear element to a page. It creates a visual effect but can also remind of a gift, a washing line, or a banner – depending how you treat it and what you add on top. How fun! I always learn something new while watching Riikka create! And I love how she revisited her goals once things changed unexpectedly! Let us know which tip you found the most interesting!